If you take the train right across Canada you’ll notice that different sections of the route use different types of train and offer slightly different services. By far the longest through train is VIA’s flagship, The Canadian – the tri-weekly transcontinental between Toronto and Vancouver. The other trains/routes covered by this book are The OceanThe Corridor (Halifax to Montreal), (Montreal to Toronto), The Hudson Bay (Winnipeg to Churchill), The Skeena (Jasper to Prince Rupert) and the privately run Rocky Mountaineer (Vancouver to Jasper, Banff/Calgary or Whistler, and Whistler to Jasper). The Canadian was first introduced by the CPR in 1955. At that time the streamlined, stainless-steel trains, designed and built in America, were considered ultra modern, representing the latest in railway technology. Thirty-seven years later VIA reinvented The Canadian, this time marketing its nostalgic appeal, elegant appearance and the luxurious comforts of old-style, long-distance rail travel. Before launching a new service aboard The Canadian, VIA carried out a massive renovation project on the 190 trains. Steam heating was converted to electric; new wiring and lighting were installed; air conditioning was introduced; showers were fitted in each sleeping car; ventilation was improved; mechanical components such as brakes and bogies were completely overhauled and the interiors were recarpeted and reupholstered throughout. The total cost of the project was over $200 million. Economy or Sleeper Touring Class? There are two ways of travelling on The Canadian: in economy class or in Sleeper Touring class. In Economy class you get reclining seats where you sleep overnight, with pillows and blankets provided (main lights go off at 10pm). The seats have pull-down trays, overhead lights, leg rests, and very generous leg room. You also have access to a panoramic dome car (see p16), though competition for space there is fierce. Sleeper Touring class is for passengers travelling in sleeping cars and is much more luxurious than economy class. This section has its own dome car and lounges and passengers have exclusive use of the dining cars. VIA’s on-board staff are almost without exception helpful, efficient and friendly. They also tend to be very knowledgeable about the train and the places it takes you through, particularly the older people who’ve worked on the railway for many years. Don’t feel shy about asking them questions – they’re usually more than happy to talk about anything to do with the journey. During the peak season, however, The Canadian gets packed out and things can get rather hectic, which leaves the staff with little time to sit around and chat. Boss of the train is the Service Manager. He or she will usually introduce him/herself to Economy-class passengers at the beginning of a trip, and explain the layout of the train, the facilities on board and give a brief description of the highlights of the scenery or towns you’ll pass through. Next in line are the assistant service coordinators, who mainly work in the sleeping cars, where they’ll see passengers to their seats and explain the facilities and service. The staff you’ll meet most, whether in Economy or Sleeper Touring class, are the service attendants, who generally run around making sure everything’s okay. The staff are attentive in both sections of the trains but Sleeper Touring class passengers are particularly well looked after, with drinks and snacks brought to their seats as and when they please. Each sleeping car has its own piping hot shower, but these are not available to Economy-class passengers, who have to make do with the wash basins. You might expect this part of the train to get a bit whiffy by the third day but this rarely seems to be the case. The passengers seem happy to improvise with the basin – or else the air conditioning is extremely effective. Moreover, the toilets/washrooms are given a thorough clean at each main stop. If you’re travelling in Economy class during the peak season (June–October) you’ll be feeding yourself at the ‘Coffee Shop’ in the Skyline Car, which serves snacks you can take back to your seats (sandwiches, crisps, and the ubiquitous Oh Henry bars) or warm meals you can eat at the tables. These are usually very tasty (pot roast, wild mushroom ravioli, grilled salmon to name but a few typical items from the menu), and cost around $12. Alcohol is served here, too, as well as in the Skyline Bar. You can’t, however, take your booze back to your seat: you must drink it where you bought it. Outside the peak season, Economy-class passengers also have access to the dining car, where all meals must be paid for as you go along (around $20–30 for three courses plus a drink). Over in Sleeper Touring class meals are included in the price of your ticket and during the peak season you have exclusive use of the dining car, with its crisp linen tablecloths and efficient service. You’re given a choice of three sittings, which are rarely on time in the busy summer months. The food is usually very good: typical main dishes might be ‘Atlantic fish chowder’, ‘rainbow trout with caper beurre blanc’, or ‘Canadian prime rib of beef, slow roasted’, to give a few examples from the menu. Breakfast is hearty – usually toast, bacon and eggs, or pancakes with maple syrup – while at lunch you’ll normally have the choice of a fish or meat dish, or a large salad. The menu always includes vegetarian options (let VIA know when booking if you are vegetarian or have any other dietary requirements, so they can make sure all passengers are properly catered for). The dining car also has a good range of alcohol on sale which you’ll be billed for at the end of your meal. Be warned that the dining-car experience can be a little manic in the middle of peak season as the harassed staff work flat out to serve three sittings of three meals a day to hundreds of hungry people. In Sleeper Touring class you can also help yourself to complimentary tea, coffee, biscuits and fruit in the Park Car and activity dome car (at the very back of the train), or get a service attendant to bring a cup to your seat. Note that smoking is not permitted on any of VIA’s trains. The glass-roofed, panoramic observation domes are probably the most famous feature of The Canadian. There’s one in the sleeping-car section and one in the economy-class section, and seats are at a premium in both. Passengers tend to treat the dome the way holidaymakers treat pool-side sun loungers: they get there early, they stake their claim and they stay there. They do get hungry, though, so you can usually find a free seat at mealtimes and in the early morning or late evening. The best time to sit in the dome is at dawn. No one’s around, the only sound is the movement of the train and Canada’s vast, wide open space is at its most haunting. If you’re travelling in Economy class you’ll doubtless find yourself surrounded by a young and cosmopolitan crowd. Fellow travellers are often backpacking or hostelling and there are a lot of Europeans on board in the summer months. Strangers strike up conversations quite easily and meeting new people is all part of the enjoyment of the trip. Between scanning the horizon for bears you can stretch your legs by wandering to and from the café or hover around the dome car in the hope that someone will offer you their seat. Sleeper Touring Class passengers are a particularly convivial lot. The service is inevitably patronized by slightly older and wealthier travellers who all appear (when thrown together three times a day in the dining car) to get on extremely well. There is a shared preoccupation with nocturnal comforts. Conversations at breakfast tend to focus on the previous night’s sleep, and conversations at dinner on the impending night’s sleep. Sleeper Touring Class passengers may also pursue a social life in the bullet lounge or the mural lounge, where they can discuss the merits of the specially commissioned artwork on display. The original murals, painted by artists from the Group of Seven (see p121), are now in a museum in Ottawa. There’s also an activity car where movies are shown in the evenings and, if you’re lucky, there may be a wine-tasting session, concentrating on Canadian wines from southern Ontario. Between Halifax and Montreal you’ll most likely travel aboard the same stainless-steel trains as The Canadian, though some services are on modern, spacious ‘Renaissance’ trains – check before booking if you’d like to travel old-style. Again, you can travel either in Economy class or in sleeping cars, though here you have a choice of two types of sleeper class. Sleeper class (formerly known as Easterly Class) is available year-round; you have full use of the dining car, though your meals are not included in the price of the ticket. Sleeper Touring class is a peak-season tourist service, including on-board commentary from guides, exclusive access to some areas of the train and priority access to the dining car (meals included in the ticket). Renaissance cars have private showers in about half of the cabins; otherwise, there are shared hot showers in each sleeping car. The train never gets as hectically busy as The Canadian and the 21-hour journey proceeds at a leisurely, relaxed pace. Moving on from Montreal to Toronto you’ll take the aptly titled ‘Corridor’ route. The LRC (light, rapid and comfortable) trains operating along The Corridor carry the highest volume of passenger traffic in Canada. The trains are sleek, modern and very fast – downtown Montreal to downtown Toronto takes just four and a half hours on the fastest trains. The train offers Business class travel, and Economy class. Business class is super luxurious: you get to sit in a posh lounge before boarding; delicious three-course meals are served to you at your seat and you’re plied with wine or liqueurs during and after each meal. Economy class has the usual roomy seats and the attendants periodically bring round refreshments for which you have to pay. The journey is more functional than recreational and you’re not likely to walk around the train meeting people. It gets you from A to B good and fast but it’s probably the least memorable train ride you’ll take in Canada. The Skeena service from Jasper to Prince Rupert, completed in 1914 by the Grand Trunk Pacific Railway, is a two-day daylight-only journey, in direct competition with the privately operated Rocky Mountaineer (see p20). The Skeena is arguably the most beautiful rail journey in Canada, taking you through the heart of the Rocky Mountains and ending in the misty, deep-green fjordland of north-west British Columbia. You’re on board the train for about 21 hours. Passengers spend a night in Prince George en route and must arrange accommodation there themselves. You can call VIA for assistance with hotel bookings: Tel 250-562-3700 for Prince George and Tel 250-624-5637 for Prince Rupert. We also give some suggestions on p216 and p220. The trains are the same stainless-steel ones used by The Canadian. The train that takes you on the 1000-mile journey up to Churchill has rather gone to seed. Operated by VIA, it’s as old as The Canadian but lacks its elegance and expensive renovations. All the same it has a charm and character all of its own and travelling aboard The Hudson Bay is a magical railway experience. For a start, there’ll be very few of you on the train unless you go in the middle of the polar bear season. This creates a camaraderie among the passengers and by the second night you may find yourself playing poker, drinking whiskey, swapping spurious anecdotes, telling obscene jokes and singing Abba songs. Life on the train gets particularly interesting north of The Pas as you’re joined by Cree and Chepewyan natives, or wizened fishermen and trappers. For once you’re travelling not only with fellow tourists or elderly Canadians but face to face with an entirely different culture. The railway provides a vital link for the small communities along this northern stretch of the route. The crew on The Hudson Bay is uniformly relaxed and friendly and, to tell the truth, a little on the eccentric side. This is no doubt due to the fact that most of them have been working this lonely line for many, many years. They know the route inside out, back to front; they will happily tell you everything they know about the land you’re travelling through and will point out osprey, geese, teal and ducks, giving you the names of all the wild flowers, trees and lakes that you’re passing. In winter it’s also worth keeping an eye out of the window even when it’s dark, as this is the place to catch the spectacular northern lights. The journey on The Hudson Bay takes 43 hours, setting out from Winnipeg around noon, arriving in Churchill at around 7am two days later. 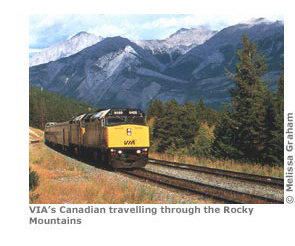 In 1989, the Armstrong Group took over The Rocky Mountaineer from VIA Rail and launched Rocky Mountaineer Railtours (now Rocky Mountaineer Vacations). It subsequently (and with some justification) dubbed its daylight-only routes as ‘the most spectacular train trips in the world’, becoming a roaring success. The flagship Rocky Mountaineer train travels along three two-day routes, each with an overnight stop in Kamloops or Quesnal included in the package: the ‘First passage to the West’ from Vancouver to Banff/Calgary; the ‘Journey Through the Clouds’ from Vancouver to Jasper; and the ‘Rainforest to Goldrush’ from Whistler to Jasper. In addition, the ‘Whistler Sea to Sky Climb’ is a three-hour trip on the old BC Railway lines from Vancouver to Whistler. All train rides can be taken in either an eastbound or westbound direction. There are two ways of travelling on The Rocky Mountaineer: Red Leaf or Gold Leaf service. Gold Leaf passengers travel in an ultra-luxurious dome car – and pay a few hundred dollars extra for the privilege. The dome area seats 74 people who are assigned seating there for the whole of the journey. Downstairs there’s an open-air observation platform and a dining area which serves hot gourmet meals (included in the price). At either end of the dome car are the ordinary coaches where you’ll be if you’re travelling Red Leaf. These are nowhere near as stylish as VIA’s stainless-steel fleet and you might be disappointed by the absence of a dining car or observation dome if you’ve already taken The Canadian, although there are complimentary snacks and large picture windows from which to admire the views. The Rocky Mountaineer, moreover, excels in other ways, primarily with their onboard service attendants. Each carriage has its own attendant who (ingenious recruitment policies ensure) will almost certainly be warm, outgoing and charismatic, putting passengers at their ease and taking excellent care of everyone. His or her duties include serving you breakfast, lunch, snacks and soft drinks at your seat (included in the price of the package) and providing you with commentary about the route. This is one of the highlights of the trip: the attendants have obviously been required to learn large volumes of information by heart, as their knowledge of the history of the railway and the landscape you pass through is encyclopaedic. They also do a good line in amusing anecdotes and corny jokes. Our attendant told us the railway workers constructing the line from Kamloops to Revelstoke were so fed up with the local fare – moose for breakfast, moose for dinner, moose for tea – that they expressed their frustration in the name they chose for the next station we were to pass. It was Sicamous. One attendant is also known to switch out the lights and recite Shakespeare through the five-mile Spiral Tunnels. The Rocky Mountaineer is essentially group travel and the service attendants encourage everyone to join in, getting people to look out for mile markers or shout out to the others if they see any wildlife. This makes for a highly enjoyable atmosphere (even if group travel isn’t normally your cup of tea), though the real draw is, of course, the magnificent scenery and the luxury of travelling through it all in daylight.